Say Hello to our BOOTY BUILDER! A few weeks ago we welcomed the newest member into our Five Points Corte Madera community…the Booty Builder! For those of you who are unfamiliar with the Booty Builder, it originates from Norway and was designed by CEO Haakon Larson to maximize tension on the glutes in order to tone and build muscle. 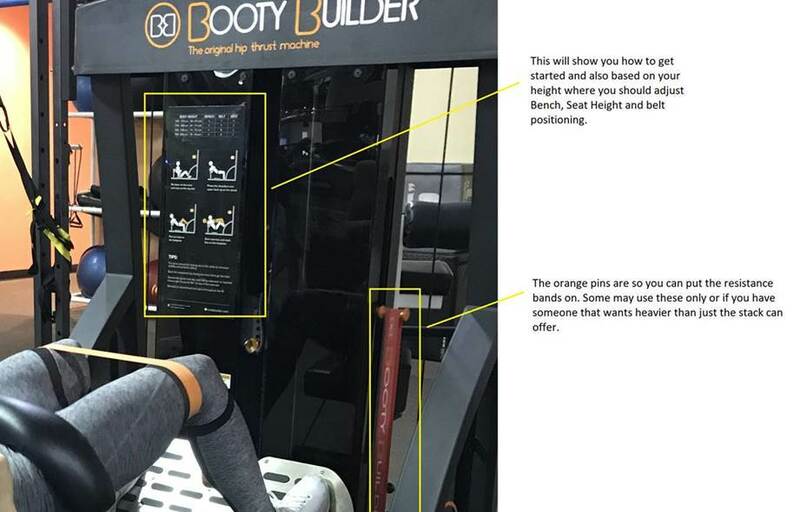 The Booty Builder utilizes the hip thrust motion, but it removes the hassle and danger of using a free-weight barbell and bench. Instead the weight is applied to the hips using a padded belt and pulley system. It’s especially exciting for us at Five Points because ours is one of only eight in the state of California! Think of it this way, the nearest Booty Builder to the south of us is in Santa Cruz, to the north is in Portland, to the west is in NEBRASKA, and to the east is JAPAN… I think it’s safe to say we’re pretty unique here at Five Points Corte Madera! Select resistance or use bodyweight only. Adjust the bench for the proper distance from the foot plates, you should have a 90 degree knee angle at the top of the movement. Sit down and lean your upper back against the bench, contact point at your scapulae. Fasten the hip belt. The lock should rest against your stomach, and the belt should rest comfortably against your hips. Place both feet on the foot plates and start the exercise by applying pressure from the heel and midfoot, contracting abs, and elevating your hips as high as possible by contracting your glutes. Lower under control, and repeat the movement for the desired number of repetitions. End the exercise in reverse, by placing the feet on the floor and unbuckling the hip belt. Be sure to reach your full range of motion, and pause in full extension for maximum benefit. Place your back on the bench BEFORE placing feet on footplate. Maintain a neutral head and spine throughout movement. Meet the Trainer: Joan Busby! Have you tried our NEW (ish) Karate Class?